Objective This study aimed to compare the hemodynamic differences among no sac (NOS), porous media (POM) and finite element analysis (FEA) models to investigate the recurrence-related risks for coiled intracranial aneurysms (IAs). Methods The study enrolled 10 patients with 11 IAs who received simple coiling treatment and hemodynamic simulations were performed for all IAs using the above three models. Velocity, wall shear stress (WSS) and residual flow volume (RFV) were calculated and compared in order to assess the model differences for both aneurysm sac and parent vessel regions. Results For parent artery regions, all three models produced similar flow patterns and quantification analysis did not indicate differences in velocity and WSS (p>0.05). For aneurysm sac regions, the FEA model resulted in higher sac-maximized (0.18 m/s vs 0.06 m/s) and sac-averaged velocity (0.013 m/s vs 0.007 m/s), and higher sac-averaged (0.55 Pa vs 0.36 Pa, p=0.006) and sac-maximized WSS (12.1 Pa vs 6.6 Pa) than the POM model. The differences in RFV between the POM and FEA models under 11 different isovelocity thresholds (0.0001 m/s, 0.001 m/s, 0.002 m/s, 0.005 m/s, 0.01 m/s, 0.02 m/s, 0.05 m/s, 0.1 m/s, 0.2 m/s, 0.5 m/s, and 1 m/s) showed that the POM RFV was generally larger than those of the FEA model. Conclusions Compared with the FEA model, the POM model provides a lower velocity and WSS and higher RFV for the aneurysm sac, which could lead to incorrect estimates of the recurrent risk of coiled IAs under high packing density. Endovascular therapy has become the main approach for intracranial aneurysm (IA) treatment.1 2 IA recurrence is a major problem that has received much attention during embolization follow-up.3–6 In a clinical procedure, a high packing density (PD) in a coiled IA (>20%) is normally desired to guarantee long-term stability.5 This value has generally been used for assessment parameters in actual practice. However, in the recent literature, the PD degree is not the only factor used to evaluate stability, and local hemodynamic parameter distribution in the neck region has gradually become a key point to assess recurrence.7 8 A detailed assessment of the neck region on blood flow characteristics is necessary to maintain therapy effectiveness. Copious hemodynamic studies revealed that computational fluid dynamics (CFD) simulations contribute to the understanding of detailed blood flow characteristics regarding aspects of aneurysm initiation, rupture and recurrence.9–25 Hemodynamic changes in the coiled aneurysm sac are an important element influencing the final aneurysm occlusion. Although many clinical studies have investigated the risk of recurrence, the mechanism underlying recurrence remains unclear. To elucidate this issue, CFD simulations are generally utilized in various simplified models to investigate the blood flow characteristics in coiled aneurysms.7–9 Park et al7 adopted models assuming no blood flow in the aneurysm sac and used only the parent artery model (no sac model, NOS) to study the neck section wall shear stress (WSS) features to determine consistency with recurrent aneurysms. However, this study does not have a comparison between different models, and blood flow occurs in the treated aneurysm sac in the early stage after coiling.22 To avoid modeling deployed coil geometric complexities in CFD studies, a porous media model (POM) was created to simulate the coiled sac, which was assumed to be a homogeneous porous medium lacking a description of the coil configuration.10 11 The blood analyses showed significant global flow stagnation, while the POM model had a severe limitation when analyzing local flow characteristics in coiled aneurysms. A third model utilizes the finite element analysis (FEA) method to simulate coils that are randomly distributed in the aneurysm sac; the FEA is a higher-fidelity modeling approach for embolic coils and can demonstrate the hemodynamic changes before the formation of thrombosis in the aneurysm sac.9 12 High recurrence risk induced by high WSS, velocity and residual flow volume (RFV) has been proposed in the recent literature.7 10 13 However, differences in hemodynamic parameters among the three models have not been reported in previous studies. Morales et al14 reported that the influence of differences in the configuration of random distribution was not significant in cases under higher PD (>22%). High PD coiling was modeled randomly in the FEA model in the current study to compare the hemodynamic differences among the three models. In the present study, we evaluated vital hemodynamic parameters that influence blood flow characteristics among the three models (NOS, POM and FEA) in various locations (ie, aneurysm sac, parent artery, and specific neck sections) under high PD, with the same boundary conditions before thrombus formation. This study enrolled 10 patients (seven females and three males) with 11 IAs treated with simple coiling technique. The average age was 52.6±8.3 (range 38–65) years old. Among them, there were eight internal carotid artery (ICA) aneurysms, one posterior inferior cerebellar artery (PICA) bifurcation aneurysm, and two middle cerebral artery (MCA) aneurysms. All male patients exhibited risk factors, including smoking, drinking, diabetes mellitus and hypertension, while only one female patient had hypertension. Geometrical models were reconstructed from three-dimensional (3D) rotational angiographic data, and 3D angiograms were acquired using six frames/s on a single arm unit (512×512 matrix, Axiom Artis Zeego, Siemens Medical Solutions, Erlangen, Germany). An intra-arterial bolus injection of contrast media was selectively performed at a rate according to the artery of interest using an injection pump (eg, for ICA, 3 mL/s with a total contrast volume of 15 mL). Next, 3D digital images were acquired using Inspace image post-processing software via a LEONARDO angiography post-processing workstation (Siemens Medical Solutions, Erlangen, Germany). Then, a region of interest containing the aneurysm sac as well as the adjacent vessels was selected on the workstation to export the reconstructed 3D image into a stereo lithography format (STL) file. The STL files of all aneurysm sacs and parent arteries were imported into Geomagic studio 12 (Raindrop Company, NC, USA) software to repair, cut, and smooth the 3D aneurysm models. All aneurysm coiling PD, which was the ratio of the coil volume to the aneurysm sac volume, was over 20%. The porosity was calculated as 1-PD. The three geometrical models were processed in Geomagic software and imported into ANSYS ICEM CFD version 16.2 (ANSYS Inc, Canonsburg, PA, USA) to create volumetric grids. Considering the presence of irregular coils in the aneurysm sac and rapid variations in the hemodynamic parameters near the vascular wall, an all-unstructured mesh with three boundary layers was generated. A grid independence study was also performed to confirm the global mesh size and the coil maximum mesh size. An unstructured grid was generated using tetrahedral elements with a mesh size of 0.2 mm for the aneurysm sac and the vessels and a mesh size of 0.05 mm for coils, which resulted in total meshing element numbers of 2.63 (IQR 1.9–2.9) million, 3.03 (IQR 2.2–3.9) million, and 6.75 (IQR 3.6–8.2) million for the NOS, POM and FEA models, respectively. where N is the number of coils released into the aneurysm sac, Vc, i is the volume of each coil, and Van is the volume of the aneurysm sac. In addition, c is the Kozency coefficient, and it is equal to 2 in this model. where L (cm) is the total length of the coil and r is the radius of the coil. The coil parameter was acquired via the manufacturer’s information. The following indexes were qualitatively and quantitatively demonstrated: streamlines, velocity magnitude, RFV and WSS contour in several representative locations. represents the wall shear stress vector, and S is the surface area. The RFV was proposed by Umeda et al,8 10 and fluid domains with an velocity >1.0 cm/s could be used to predict aneurysm recurrence in some circumstances. In this study, RFVs with 11 different specific velocity values (0.0001 m/s, 0.001 m/s, 0.002 m/s, 0.005 m/s, 0.01 m/s, 0.02 m/s, 0.05 m/s, 0.1 m/s, 0.2 m/s, 0.5 m/s, and 1 m/s) were calculated between the POM and FEA models. All data were analyzed using SPSS version 22.0 (SPSS Inc, Chicago, IL, USA). The inter-group differences were compared using a one-way analysis of variance (ANOVA) test for continuous variables. Two groups of continuous samples were compared by paired t-test. A value of P<0.05 was considered statistically significant. As shown in figure 1A, among the three models (NOS, POM and FEA), similar flow patterns for the parent artery were observed from the velocity streamlines, isovelocity (velocity >0.02 m/s) and WSS distributions. This observation was confirmed by quantitative analysis using vessel-averaged and vessel-maximized velocity and WSS values with all P>0.05 for the three model differences (figure 1B). 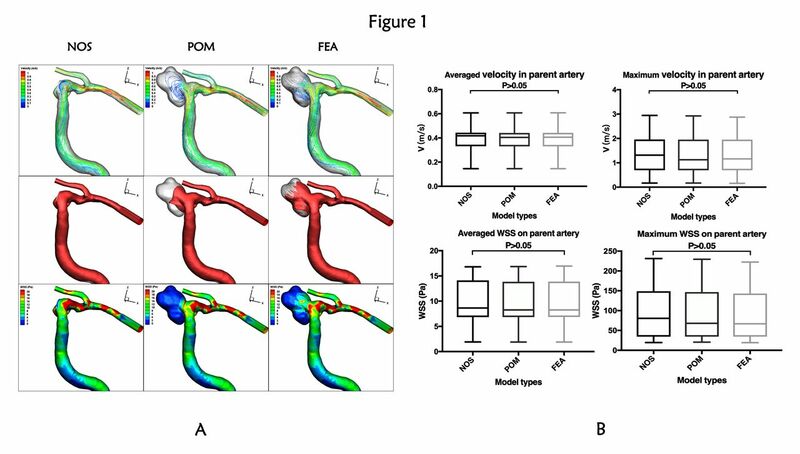 Parent artery hemodynamic distribution, including the velocity streamlines, isovelocity (velocity >0.02 m/s) and WSS (A), and quantitative comparison of average and maximum velocity and WSS among the NOS, POM and FEA models (B). FEA, finite element analysis; NOS, no sac model; POM, porous media model; WSS, wall shear stress. Figure 2 A1-A3 and B1-B3 demonstrate the flow visualization for the aneurysm sac in the POM and FEA models. From the velocity distribution of the middle neck sagittal plane, a homogeneous distribution was observed from the POM model, while a heterogeneous flow pattern was revealed from the FEA model (figure 2 A1 vs B1). Furthermore, the FEA model generated a lower RFV than the POM model using the same isovelocity surface threshold of velocity >0.02 m/s (figure 2 A2 vs B2), which resulted in a higher sac WSS value from the FEA model compared with the POM model (figure 2 A3 vs B3). 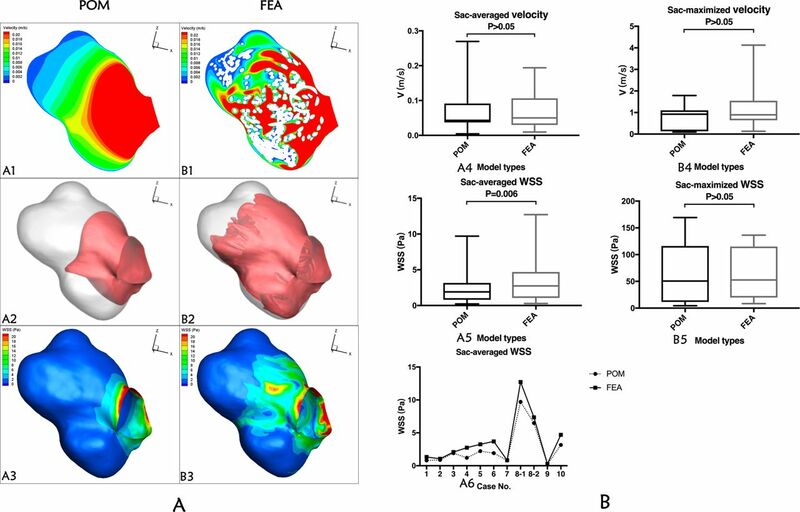 Aneurysm sac hemodynamic distribution, including the velocity magnitude field on the middle sagittal neck plane, isovelocity (>0.02 m/s) and WSS (A), and quantitative comparison of the average and maximum velocity and WSS between the POM and FEA models (B). FEA, finite element analysis; POM, porous media model; WSS, wall shear stress. The quantitative analysis indicated that the FEA-based model resulted in a higher sac-averaged velocity (0.013 m/s vs 0.007 m/s) and sac-maximized velocity (0.18 m/s vs 0.06 m/s) than the POM-based model (figure 2 A4 vs B4), although the difference was not significant (P>0.05). The sac-averaged WSS from the FEA model was significantly higher than the WSS value from the POM model (0.55 Pa vs 0.36 Pa, P=0.006), while the sac-maximized value of the FEA model was also higher than the value from the POM model (12.1 Pa vs 6.6 Pa, P>0.05) (figure 2 A5 vs B5). 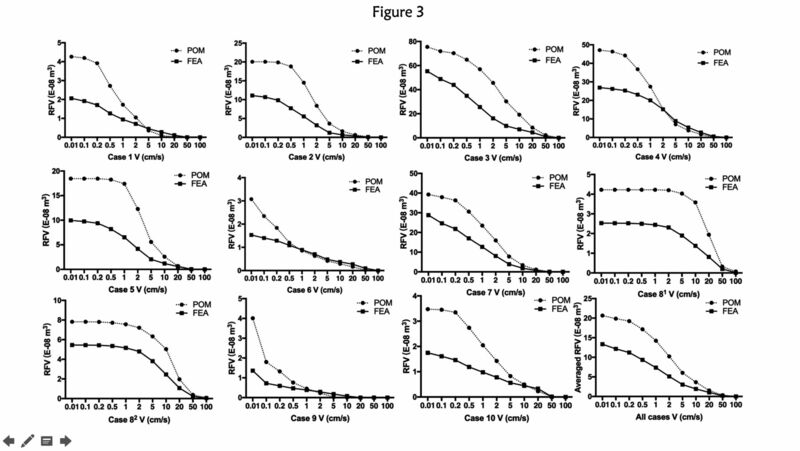 Furthermore, figure 2 A6 demonstrates that the FEA-based sac-averaged WSS was larger than the POM-based sac-averaged WSS in each aneurysm case. The difference in RFV between the POM and FEA models under 11 specific isovelocity threshold values (0.0001 m/s, 0.001 m/s, 0.002 m/s, 0.005 m/s, 0.01 m/s, 0.02 m/s, 0.05 m/s, 0.1 m/s, 0.2 m/s, 0.5 m/s, and 1 m/s) showed that RFVs in the POM were generally larger than those of the FEA model (figure 3). Figure 4 demonstrates the RFV differences of one typical case on the middle sagittal neck plane from the FEA and POM models with 11 different isovelocity threshold values. RFV and averaged RFV comparison between the POM and FEA models for all 11 cases under 11 different isovelocity thresholds (0.0001 m/s, 0.001 m/s, 0.002 m/s, 0.005 m/s, 0.01 m/s, 0.02 m/s, 0.05 m/s, 0.1 m/s, 0.2 m/s, 0.5 m/s, and 1 m/s). FEA, finite element analysis; POM, porous media model; RFV, residual flow volume. 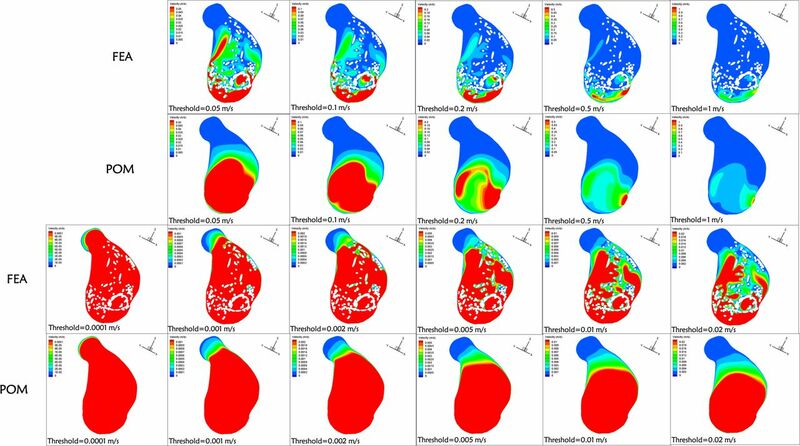 Velocity magnitude comparison between the POM and FEA models under 11 different thresholds of a typical aneurysm case. FEA, finite element analysis; POM, porous media model. IA CFD simulations have shown great consistency with clinical results.20 21 To date, the POM and FEA models have been used to analyze IA recurrence from coiling or stent-assisted coiling embolization treatment.8–10 This study aimed to compare the hemodynamic parameter differences among three models after embolization and reveal the potential recurrence risk factors associated with these differences. To our knowledge, this is the first study to show that the velocity and WSS are underestimated and the RFV is overestimated for the aneurysm sac using the POM modeling method compared with the FEA modeling method. In the NOS model, the blood flow of the sac was assumed to be completely thrombosed. Park et al7 utilized the NOS modeling method to evaluate the recurrence risk and indicated that a higher WSS on the neck transverse plane indicated recurrence. However, histopathological studies22 have revealed that during the first month after coiling treatment, thrombus formation and active inflammation occur within the aneurysm dome. Therefore, considering the blood flow in the sac immediately after coiling is more reasonable for assessing the potential relapse risk. In the POM model, the flow in the coiled sac is regarded as an identical porous media that consists of uniform particles, including in the neck region. The volume of the POM is determined by the diameter of the coil, and the porosity is determined by the PD. However, the coil distribution in the FEA model, particularly in the neck region, is heterogeneous and sparse; therefore, a relatively high blood velocity region remains compared with the POM in the neck region under a higher velocity threshold as shown in figure 4. Morales et al14 reported a slight difference in hemodynamics due to high PDs (near 30%). In our study, all aneurysms had PDs >20% (7/11 cases >30%). However, in our data, the POM model revealed larger RFVs than the FEA model, which was consistent with a previous study,23 and this finding indicated that the POM model might overestimate the recurrence risk with regard to the RFV. The RFV represents the residual blood of the aneurysm sac after embolization; therefore, the RFV value influences the thrombosis process in the sac, and a larger RFV indicates a slower thrombosis. When the thrombosis progress is halted, it may result in recurrence. The POM model presumes that the coils are homogeneously distributed in the aneurysm sac, including the neck region. Therefore, if the neck region does not have a higher PD than the rest of the sac, then the FEA model might be a more reasonable modeling method to assess the recurrence of IAs in the early stage. Umeda et al10 demonstrated that RFV was an independent risk factor for recurrence in coiled aneurysms using the POM model, and with the help of an ROC curve, they found a characteristic boundary value (20.4 mm3). Not every aneurysm can reach a high enough PD to prevent recurrence. When the RFV does not reach the specific threshold value, the recurrence rate can be controlled. Due to the irregularity of the RFV topology in the FEA model, the WSS values in the neck areas were larger than those in the POM model; however, the RFV values were less than those of the POM model, which indicated that the coil shape changed the blood flow patterns. A study by Park et al7 implied that even if aneurysms were densely packed, they could recur because of residual flow. WSS plays a crucial role in IA recurrence. Recent animal models have shown the pivotal effect of WSS in IA initiation and indicated that aberrant WSS can disrupt the balance and drive IA growth and rupture.24 Increased neck WSS of the aneurysm after complete embolization can highly increase the risk of recurrence. This result was also supported by animal experiments, where high WSS was correlated with the destruction of the intima, reduction in the muscularis mucosa, and loss of the fibrous matrix.25 Due to the coil heterogeneity distribution, the WSS on the sac wall was higher in the FEA model than in the POM model in our study. Based on our findings, we speculate that the higher WSS induced by coil heterogeneity on the sac and neck wall region may prevent sac clot formation, which is required to maintain effective occlusion. In our study, even if the embolization rate was higher than 30%, in the case of incomplete thrombosis, the coil shape and distribution still affected the hemodynamic changes in the sac and neck. Compared with the FEA model, the POM model provides a lower velocity and WSS and higher RFV for the aneurysm sac, which could lead to incorrect estimates of the recurrence risk of coiled IAs under high PD. YJ and LG contributed equally. Contributors XZ and JX conceived and designed the research. YJ acquired the data. YJ, LG, RD, GL, GHL and LH analyzed and interpreted the data. YJ, XL, SZ and HW performed the statistical analysis. XZ, DG and JX handled the funding and supervision. YJ and LG drafted the manuscript. All authors made critical revisions to the manuscript for important intellectual content and reviewed the final version of the manuscript. Funding This study was supported by the National Nature Science Foundation of China (Grant No. 81771242 and 81371308). Patient consent The Institution Review Board of Huashan hospital affiliated to Fudan university approved this retrospective study and waived the requirement for informed consent.